The tea cupboard is straining at its hinges with boxes and boxes of tea bags. That’s right, a tea cupboard because we surpassed the tea chest long ago. A recent trip to India resulted in a tea frenzy which means that there are now enough herbal teas to feed an army of detox-ers. Several types of Tulsi tea, a mint tea, a terribly sharp ginger tea and masala tea, plus an un-labelled one that I dubbed ‘mystery tea’. As well, I was given some incredibly good quality black loose leaf tea by a friend. 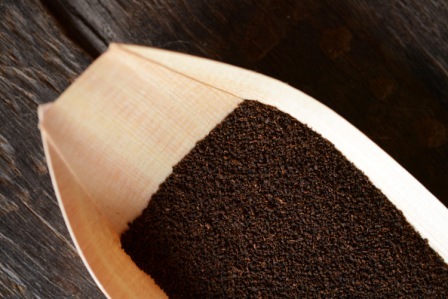 It was grown on his parents’ tea estate at a hill station in a beautiful part of south India. This friend grew up surrounded by rolling hills of a lush green carpet as far as the eye can see, at the top of a mountain with no mobile phone reception and little in the way of entertainment. He tells tales of encountering wild animals in the front garden. A tiger lurking among the bushes. A leopard slinking along the rows of tea. The wild bison he says, with mild annoyance, eat the roses that his mother painstakingly cultivates. And we listen in awe, myself a city baby to the core (Mumbai, Sydney, London). To me these stories are almost from another world, one where fresh mountain air is abundant, Wi-Fi is but a pipe dream and wildlife roams unhindered in the garden. For weeks I have wanted to create something beautiful using that fragrant loose leaf black tea. Something other than, well, tea. When I stumbled across the Sweet Adventures Blog Hop event with its current theme of Sweet Surprise, I knew I had to come up with something that incorporated the tea and pushed my boundaries in the kitchen. In a small non-stick saucepan on low-moderate heat, melt the sugar. Remember when melting sugar, you want to just agitate the saucepan rather than stirring the melting sugar as that will cause it to crystallise. Take the saucepan off the heat and add the butter- stir until the butter melts and it is somewhat incorporated (it will not blend completely). Then, add the cream and return to the heat. Boil on low-moderate heat until it becomes a dark golden colour and reaches the soft-ball stage. To test this, drop a pit of the caramel into a cup of cold water. If a soft ball forms that you can actually pick up, it is ready. Pour the caramel onto a plate lined with grease-proof paper and place in the freezer for 20-30 mins. When set, form the caramel into little balls about the size of a large olive. Grease the mini ramekins well. Line them with grease-roof paper. Boil about 1 1/2 L of water in a large saucepan or in the kettle. In a medium saucepan, place the milk, tea, vanilla (seeds and shell), half of the ginger, 5 of the cardamom pods, crushed (seeds and pods) and the cinnamon. Bring to the boil and simmer on low heat for about 10 mins. Take off the heat and place in the fridge to cool and infuse. Once cooled, strain into another cup. You will be using 1/3 cup + 1 tbsp of this milky tea. In a large mixing bowl, cream the butter and sugar using an electric beater or a whisk and a powerful arm. Add the egg and beat until incorporated. Powder the seeds of the remaining cardamom pod and add this along with the other half of the grated ginger. Add the milky tea (1/3 cup + 1 tbsp) and the flour in alternating batches, stirring in between. Stir until all the ingredients are well incorporated. You can use the electric beater for this. Fill the ramekins with the mixture to about 1/2 cm from the top. Place in the steamer and place the steamer on top of a large saucepan half filled with boiling water. Try and ensure it is a fairly tight fit. Put the lid on the steamer and cook on moderate heat. After about 20 mins, remove the lid and push on one of the puddings with your finger- if it is cooked with a spongy consistency, push a caramel ball into the centre of each pudding so that is about 1/2 cm below the edge of the ramekin. Cook a little longer before inserting the caramel if it is undercooked. The pudding would have risen well above the rims of the ramekins. Put the steamer lid back on and steam for a further 5-8 mins. Allow the puddings to cool slightly, then run a knife along the top of the ramekin to remove the overhang. Eat the overhang immediately before anyone else gets wind of it. Run the knife around the edge of the pudding to loosen. 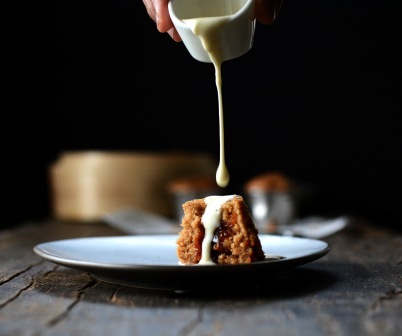 Tip the puddings onto a plate or serve in the ramekin with some cream or vanilla ice cream. I used these little stainless steel cups I had that are 6 cm in diameter and 4 cm high. 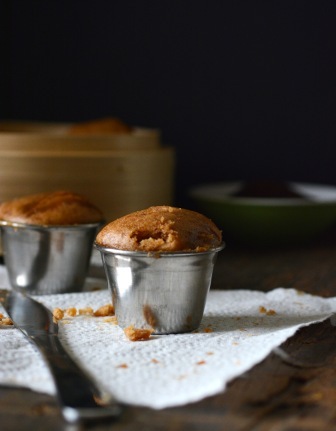 Mini ramekins would also work well. Or double the pudding recipe (the caramel amount should be adequate) and use normal sized ramekins, with larger caramel balls. If using small cardamom pods, use two in the pudding mixture instead of one. Arghhhhhhhhhhhhhh! Absolutely delicious! That sounds totally wonderful. I need to keep this for reference, because a) there is a CARAMAL surprise, b) well, it always eludes me, when opening my tea cupboard, how I possibly will manage to use all this tea in my lifetime and c) eh … I simply have to. Agreed Chris! All three are perfectly valid and well thought out reasons 🙂 Hope you do try it. These puddings look absolutely delicious, I love chai flavoured anything! And combined with caramel sauce… well I think I’m in heaven 🙂 Thanks for joining the hop! Thanks Swah. I’m glad the deliciousness translates in the pic. The hop was fun, thanks for hosting. These look fantastic.. I love a good chai and a good pudding (esp on a stormy day like today! ), so can’t wait to make them. And love your pics too! Thanks & I agree. Chai + pudding+ caramel can only be a good thing right? Thanks Azmina! I actually found steaming easier than baking in some ways as you are less likely to burn the cakes. And the texture was lovely. Hehe….maybe we should organise a tea swap next! SABH was fun, you guys do a great job. Thanks JJ! 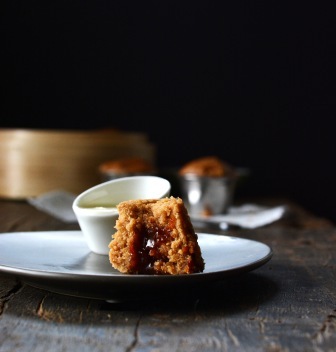 I absolutely adore anything chai flavoured — this looks divine, your photos are incredible! Thanks Jess. 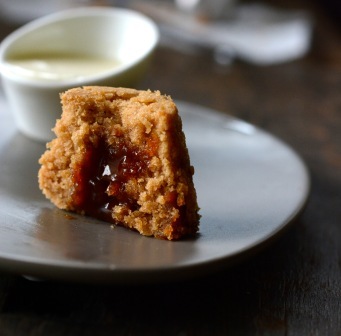 Your chai Madelines look lovely as well. Very much a newbie to photography so that is wonderful to hear. Might have to invite friends for dinner so I have an excuse to bake! Your friends upbringing seems so surreal to me. We have kangaroos here .. but that’s about as exotic as it gets. No tigers! I wish I could pick my own tea. I still really want to do berry or fruit picking. Love this cake. It would have such a beautiful flavour. I know, right? I went strawberry picking at this German village near adelaide when i was a kid but would love to do something like that again.